1. 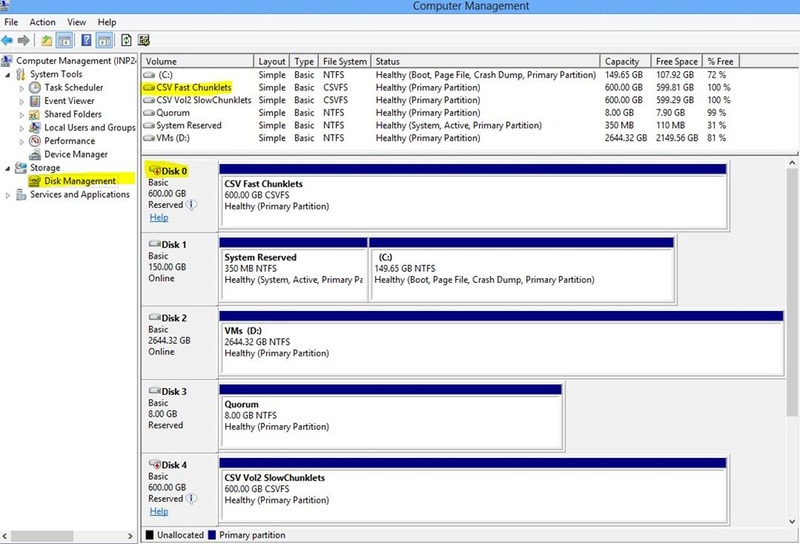 Online/Offline status in Disk Management. Take a look at the screenshot below. I was troubled by seeing the CSV offline. I thought there was a problem (not really). You cannot map a drive to C$ and try to view the contents of C:\ClusterStorage\VolX. There will NOT be any error but the contents of that directory will be blank. You can RDC to the hyper-V machine and view the contents of that directory successfully. The moment you add a disk to cluster storage volume, it will lose its drive letter. This is by design (normal). A CSV is supposed to be accessed via its map point under C:\ClusterStorage\VolX. This is noticeable in the screenshot above.